Do you feel like you need something to aim for? You can take part in a Swimathon at Biddulph Valley Leisure Centre helping raise money for Marie Curie Cancer Care. Having a goal in mind is a great way to focus your workouts and motivate yourself. The swimathon takes place at the leisure centre on the weekend of April 17th – 19th. 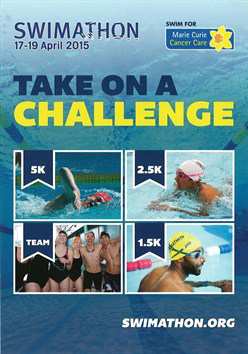 You can raise money for Marie Curie Cancer Care by swimming 1.5 km, 2.5km or 5k, you can even enter the 1.5km and 5km as a team. The event is fully organised with dedicated lanes, so all you have to focus on is doing some training, raising lots of money for this great charity and enjoying the swim! To register, just go to http://my.swimathon.org and follow instructions.